In early 2008 a small group of enthusiastic Toowoomba men met with the idea of forming an all male barbershop style singing chorus. 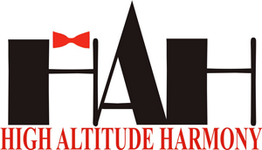 High Altitude Harmony, or HAH, was the result and we have quickly grown into one of the most respected entertainment groups in the Toowoomba and Darling Downs region. The first real home for the rapidly expanding HAH was the old main hall at Toowoomba State High School. HAH was able to stage several performances, and our first major fund raiser, the now famous annual singing restaurant, at this venue. Further expansion of the group, causing a need for more suitable facilities, saw us temporarily move to the hall at Baillie Henderson Hospital, followed by a somewhat longer stay at the Toowoomba RSL. Finally, in 2012, we moved to our current home in the Toowoomba Choral Society buildings on the corner of Bridge and Raff St. While the main focus of HAH has always been to encourage singing enjoyment amongst our members, we also believe that enjoyment comes from constant improvement. To that end, HAH competes regularly in various events. Our competitive exposure has included the Toowoomba Eisteddfod, regular appearances at the Sunshine Region Barbershop Convention, finishing twice as medium sized chorus champions, as well as the bi-annual Singfest on the Gold Coast. In 2013 HAH successfully hosted the Sunshine convention for that year, with over 700 people attending throughout the event from across south eastern Queensland and northern NSW. HAH also went to the 2009 Barbershop Harmony Australia National Convention in Hobart, finishing a very creditable eight, and backed it up in 2011 with a seventh placing at the Brisbane Convention. The Brisbane Convention also doubled as the Pan Pacific contest for that year, giving HAH exposure to International Choruses and Quartets from New Zealand, Japan and the USA. Of course HAH mostly singings locally, having performed at various shows and events across the region. We regularly sing at Australia Day, and have sung the national anthem to open both the Weetwood races, and the Toowoomba Royal Show. In 2012, HAH also had the pleasure of being the local support act when Benchmark and “The Old Fella”, both well known contestants from Australia’s Got Talent, appeared at the Empire Theatre. As can be seen, HAH is a dynamic group and has many more regional, national and international adventures planned for the future.